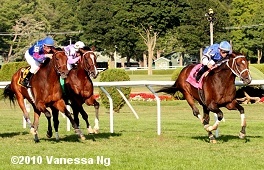 The feature race this weekend at Saratoga Race Course was the $500,000 Sword Dancer Invitational (G1), the top turf race of the meet and a major prep for the Breeders' Cup Turf. A field of 9 older horses went to post on Saturday in this 1 1/2 mile inner turf event, before 30,210 fans under sunny skies and temperatures in the 80's. 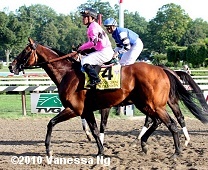 Expansion was sent off as the 2-1 favorite off two third place finishes in Grade 1 company, in the Manhattan Handicap and the Man o'War Stakes both at Belmont Park. In to challenge him included 4-1 second choice Bearpath, fourth in the Man o'War last out, and 9-2 third choice Marlang, off a victory in the Sunset Handicap (G3) at Hollywood Park. Soon after the start, jockey John Velazquez sent Marlang to the front and he set slow early fractions of 24.28, 48.27, 1:13.23, and 1:36.62 over the firm turf, while as many as 2 lengths in front of 36-1 Interpatation and 7-1 Al Khali who stalked him second and third respectively. 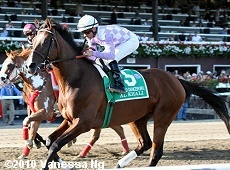 Javier Castellano kept the favorite Expansion in midpack fourth for the first mile. On the far turn for the last time, Marlang tired badly and faded to finish last, allowing Al Khali to inherit the lead at the top of the lane through 1 1/4 miles in 2:00.76. 10-1 Telling, fifth early, came through on the rail, outfinishing late-running Bearpath in the final furlong to win by 1 1/2 lengths in 2:25.29. It was another 1 1/4 length back to Al Khali third, while favorite Expansion finished 5th. 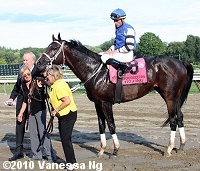 Left: Telling in the winner's circle. His trainer Steve Hobby said, "Garrett had him in a perfect place all the way. The pace was a little slower, but he was in a good spot. He sure chose the right way - that's the one thing I told him, that he probably prefers the outside than being in, but it's not something I'd make a drastic change to do. It's tremendous to win again - it's something we had aimed at from the last time, and to make it work a year later is really amazing." 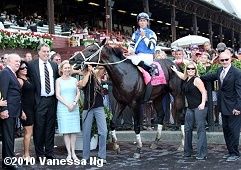 Right: Telling's owners Alex and JoAnn Leiblong lead him to the winner's circle. Left: Telling gets hosed off before returning to the barn. His jockey Garrett Gomez said, "He broke well and I really felt like I was in great spot. When they quickened up the backside, I was having a little trouble telling how fast they were actually going and deciding whether or not to go after the leaders at that point. But my horse was bobbling a bit so I decided to switch him to the outside a little and wait. When we turned for home, the horse in front of us dropped off. I just dove toward the fence, and it was like he found new life. He's just one of those horses that stays on really well going 1 1/2 miles. It's a real pleasure for me to win a race for Steve Hobby because the first recognized race I ever rode was for his dad. That horse didn't win, but I told Steve today that we better win this one for his dad." Right: Telling in the paddock before the race. Left: Second place finisher Bearpath heads out for the post parade. 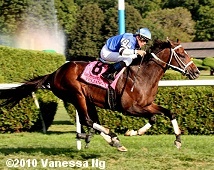 His trainer Ian Wilkes said, "I thought he ran great, I really did. We were just second best. I felt he belonged in here today, and he showed it." 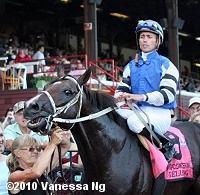 Jockey Calvin Borel added, "He ran a great race, no excuses. He maybe could've gotten through a little bit faster. The pace up front was pretty honest and I thought we were sitting pretty well. Everything went perfectly; we just got outrun." Right: Third place finisher Al Khali warms up before the race. 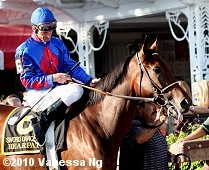 His trainer Bill Mott said, "It was a smooth race. He had a good trip. He inherited the lead after (Marlang) retired early. Turning for home, he was asked to run and he opened up a little bit, but he couldn't hold on. He was clearly beaten for the win." Fifth place finisher and beaten favorite Expansion returns after the race. His trainer Chad Brown said, "Around the 3/8 pole he was bumped and carried out pretty far, and Javier thought he maybe lost his stride a little bit there. From there, he was kind of unorganized the rest of the way down the lane. On top of that, the horse is probably more effective going 1 1/4. The combination of those two things probably prevented us from hitting the board. I was worried about (distance) all week. I ran him here based on the competition. Given how much money is on the line, that it's a Grade 1 at Saratoga, and that he's going off at 9-5, it's a great spot for him. Moving forward, we are going to shorten him up a bit."